You may have heard this district name so many times in our previous posts. We mentioned some places located at this street. Passeig de Gracia is a famous location in Barcelona city where many tourists visit and locals spend their most of the time during a day. What can you do in Passeig de Gracia? There are many good restaurants and cafes to relax when you get tired. This location is also connects Plaça De Catalunya and Carrer Gran de Gracia. Passeig de Gracia is known as the most expensive street in Barcelona city. This street contains many shops, restaurants, historical buildings, special pieces of art and business areas. If you are shopaholic and love expensive pieces then Passeig de Gracia is the right place for you. 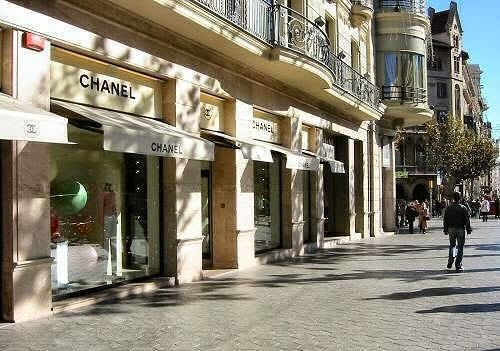 For instance, Chanel or Prada are the only few examples for luxury places in Barcelona city. The fashion's heart beats in Passeig De Gracia street. On Passeig de Gracia, you can see Casa Battlo or Casa Mila. If you don't want to waste much money, you can go for a walk as it contains big and green area. It has got fresh air. Don't forget to have a look at the street lights. They make take your attention. Passeig De Gracia is a street that you can access easily from Las Ramblas and Plaça De Catalunya by walking for a short time. For famous streets in Barcelona try to follow Barcelona city guide's posts. To see how the daily life is going on in Passeig De Gracia, you may want to check the video. Thanks to Viagensimagens for the video.